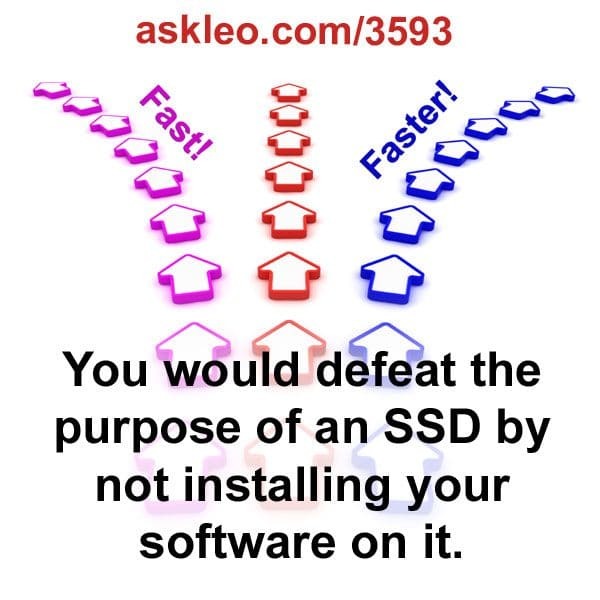 You would defeat the purpose of an SSD by not installing your software on it. - Ask Leo! You would defeat the purpose of an SSD by not installing your software on it. Installing software safely and with minimal impact - Installing software safely is something that I suspect many don't really think about, even though installing software is something we do often. I'll review some recommendations to minimize both impact and danger. Can I use the free backup software that came with my external drive? - Many external drives include free backup software. I'll review why I rarely use what comes with the drive and prefer making my own choice. « Previous post: If somebody puts your information on their website there’s no way to force them to remove it.